In 1970's Chile Pablo Neruda, the Nobel-prize winning poet, is close to death, and he senses the end of an era in Chilean politics but there is one final secret he must resolve. He recruits Cayetano Brule, a young Cuban rogue, as his "own private Maigret" and lends Brule the novels of Simenon as a crash course in the role of private detective. Brule must travel across the world, through Neruda's past and the political faiths he has espoused, retracing the poet's life from Fidel Castro's Cuba to Berlin, Mexico City to Bolivia. Brule desperately tries to fulfil Neruda's final request amid the brutal beginning of Pinochet's dictatorship while all the poet once believed in is swept away. Evocative and romantic, The Neruda Case spans lies and truth, travelling between uneasy peace and political coup, from life to death. Brule, a daydreamer and reluctant detective, is lost among Latin America's uncertainties, venality and corruption while his first case introduces one of the great characters of international crime fiction. 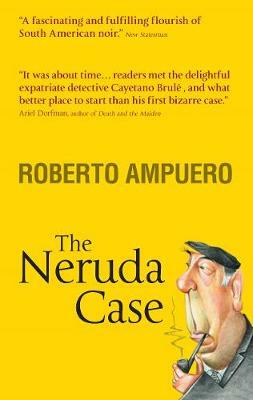 Among the pleasures of The Neruda Case is its provocative fictional portrait of Pablo Neruda, as the poet re-evaluates his life and begins to question abandoning those he loved for his poetry. This is the first English language translation of Roberto Ampuero's atmospheric Brule detective novels and brings South American noir to a new audience.